In this Thursday, March 21, 2019, photo, fires burn at the site of a factory explosion in a chemical industrial park in Xiangshui County of Yancheng in eastern China's Jiangsu province. 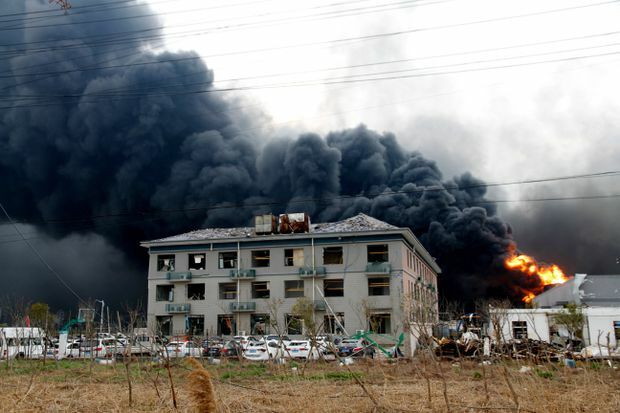 The cause of the explosion was under investigation, but the company – which produces more than 30 organic chemical compounds, some of which are highly flammable – has been cited and fined for work safety violations in the past, the China Daily said. Police, some wearing face masks, sealed off roads to the plant. The power of the blast smashed windows in the village of Wangshang two kilometers away, and shocked villagers likened it to an earthquake. “There have been little accidents before, but nothing like this,” one resident, who gave his family name as Wang, told Reuters. “There was one loud bang followed by a long rumble. All the windows were smashed. I went to have a look. Near the site there was blood everywhere. People were crushed,” he said. President Xi Jinping, who is in Italy on a state visit, ordered all-out efforts to care for the injured and to “earnestly maintain social stability,” state television said. Authorities must step up action to prevent such incidents from happening and find out the cause of the blast as quickly as possible, Mr. Xi added. “There have recently been a series of major accidents, and all places and relevant departments must fully learn the lessons from these,” the report cited Mr. Xi as saying.